DeAndre Joshua dead in Ferguson: 20-year-old apparently killed during protests. 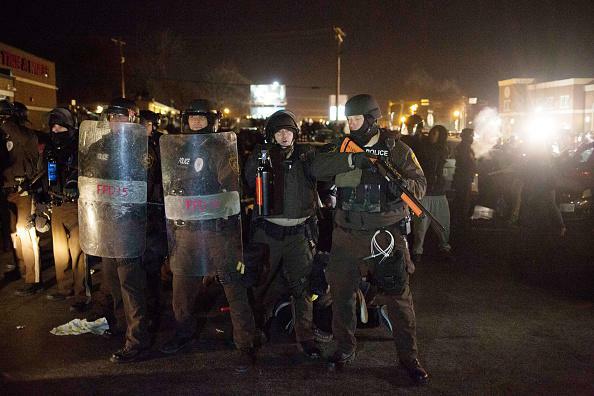 Police in Ferguson on Tuesday night. At 9 a.m. Tuesday, a resident of an apartment complex spotted Joshua’s body inside a parked car, a white Pontiac Grand Prix, near Canfield Green Apartments, the same complex where Ferguson Police officer Darren Wilson shot Brown on Aug. 9. Blood-soaked shattered glass lay in a pile on the ground beside the car. Joshua was shot in the head, CNN reports, and gasoline had been used to light his body on fire. Joshua was reportedly a friend of Dorian Johnson, the Ferguson resident who was with Michael Brown when Brown died. Forty-five people were reportedly arrested in Ferguson Tuesday night as the town’s City Hall, and a Meneike auto repair shop were damaged by rioters, though St. Louis County Police Chief Jon Belmar described Tuesday as “a much better night” than Monday in terms of violence and property damage.